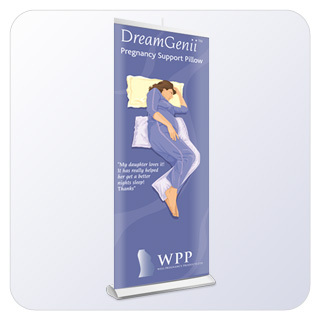 www.iad.co.uk > exhibition material > World Pregnancy Prodcuts Ltd. The late second and third trimester can prove to be an exciting but tiring time for expectant mothers. Along with the excitement of the forthcoming arrival comes the nervousness about the birth and the physical difficulty in sleeping comfortably. WPP has designed a unique pregnancy support pillow to aid restful and supportive sleep from around 25 weeks onwards.